Home NEWS POSTS Codemint announces the inclusion of computer science project topics and research materials in their online academic repository. Codemint announces the inclusion of computer science project topics and research materials in their online academic repository. Codemint, a project and research website is glad to announce the successful inclusion of computer science project topics and research materials in their online repository of undergraduate academic projects recently. This development was prior to the recent update on codemint in the last season following the research need of computer science undergraduates. “Having done our research on student’s need, we have realized that the research need of computer science students is scarcely met. This set of students seems to need more assistance when compared to the others” explained Japhet Johnson, the Lead Programmer, Codemint. “The recent decision to add it in our resource list is deliberate; and the purpose is to provide adequate research materials for computer science undergraduates as much as we can. So far, new topics in computer science have been added including computer source codes for their implementation”. 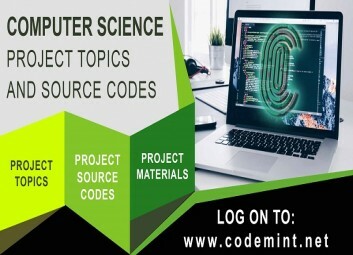 To view the list of computer science project topics on codemint and their full materials please visit https://codemint.net/computer-science/computer-science-project-topics. If it may interest you, visit the codemint repository for undergraduate project topics and research materials for final year students via https://codemint.net/ . Like highlighted earlier, this drive to include computer science students in this online research plan was motivated by the research carried out. The report, as already revealed by the spokesperson, Japhet Johnson, is a huge indication that their services all these while have been biased and that including them in this plan wouldn’t be a bad idea. Computer science students will definitely face less stress in their project research process following this new plan. To reveal how much have been put in place, the implementation of each project topic is made easy with the availability of soft wares and computer source codes already built and stored for use by students. The list of computer science research topics are already provided for free on the page which link has been provided above. Likewise, a click on each project topic takes you to the abstract and the first chapter of the project material. Full access to the entire project materials is gained after students might have made adequate request for the project material in question. Does this new plan include other academic cadre in computer science? Ofcourse, the computer science project topics and research materials includes undergraduates, post graduates, Masters and PhD students in their plan. This simply implies that the project topics as well as the source codes are categorized to suit each level of academic learning. Does codemint discourage personal research and self-development? The research materials provided for use by computer science students is not to discourage personal research, intellectual competence nor anything of sort. The idea is that students use the resource codemint provides to aide their research. Computer science students are expected to review the content or better still do a new topic entirely following the guides that the materials provide. In other words, they offer a blueprint for student’s final year projects. To support this claim, this caution is included in the terms and policy of service for codemint and in extension computer science projects topics and materials. How does codemint source this deluge of resources for computer science students? Codemint crowd-source research materials from experts who gets rewarded at the end of the day. This is to ensure diversity, originality and flexibility adding to the corporate aim of creating a community for programmers both veterans and budding programmers. What other opportunities does codemint offer computer science students? The inclusion of computer science projects in the recent codemint update has availed computer science students with several opportunities including freelancing through the mint-300 campaign, outsourcing and the codemint academy incentive which aims to train budding programmers with conventional tools for web programming and the likes.